Down Payment Savings ($2000): This is right on track.” The goal is to get to $10,000 by mid-summer. That being said, I already know we won’t have the full $2,000 for this month (May). Initially, we were hoping to start house-hunting this month but we thought better and have pushed it back a bit. We are really hoping to have a closing in August/September, so we didn’t want to see something and fall in love too early when we really aren’t ready to be making offers and negotiating yet. Womp, womp! It’ll be here soon, though, and I’m still doing Zillow searches just-for-fun. Electricity ($88): Our electric bill has never been lower! But we’ve already been flirting with triple-digit temperatures and our A/C is back in the ON position! I already received the bill for May and, although it hasn’t jumped way high yet, it’s certainly higher than April’s bill. Restaurants ($249) + Groceries ($582): I feel like you can’t consider one without knowledge of the other. Our grocery bill was pretty low this month (remember in months’ past where I was nearing the $700-mark for groceries!? ), but the grocery bill is low because (1) we were on the cruise for one week of the months, and (2) our eating out budget was HUGE! Remember my post about blowing the restaurant/eating out budget early in the month? We aim to have this expense around $200 or less for our family of four. We blew this budget category early in the month and, honestly, the only reason it didn’t surpass $300+ is because we were gone the last full week of the month (longer, really, since hubs and the girls drove they added an extra week to their trip). All expenses while traveling were filed away in the “cruise” category, so they weren’t accounted for here. Entertainment ($1): 99 cent song on iTunes. Kids’ Activities ($82): This was our last month paying for the girls’ swim lessons. It was prorated since we only went for half the month. That being said, the girls did INCREDIBLE on our cruise! We spent a TON of time in the water (both in the pools on the ship and in the ocean at our docking places). I was so impressed with how their skills have improved and they seemed like little fishes splashing around in the water. It really made me want to re-start their swimming lessons so they can keep learning and improving. I’m waiting until the semester is over at school because the end-of-year time is crazy and our Saturday-midday swim class was far from ideal. When we start back again I’ll be looking for a weekday afternoon class time. Household Goods ($9): I don’t remember if I mentioned it already, but I’ve deemed this year the year of buying holiday decorations on clearance to save for next year. In December/January I bought a bunch of Christmas decorations and in April I bought some Easter decorations. I go literally the day after the holiday, first thing in the morning, so I can try to find the best stock for cheapest. I know there can be great finds at garage sales, too, but those are so hit-and-miss that I’ve mostly relied on buying store stuff on clearance after the holiday has passed. The plan is to do this all year for all of the holidays. I’m pretty excited to finally start accumulating some holiday stuff here and there. We’ve always been very minimalistic when it comes to holiday decorations since we have typically moved every year (our current rental house is the longest we’ve ever stayed in a single place!!) I look forward to decorating for holidays with the girls as they grow! 3-6 Month EF: $1,000. The goal is to get to $5,000 and we currently have $3063. Birthdays: $400. The girls’ birthday is on the horizon in June. To date, we’ve never had an actual birthday party for them, but we want to this year for the first time. It will still be simple (at our house, not another venue), but we’re going to start throwing a couple hundred a month toward this savings so we don’t get caught by surprise in June. This month I’ve over-saved because I’m anticipating that May will be a lower month. Car Repairs: $50. I also withdrew $182 to finally fix the car part that broke 2 weeks after I paid it off. This leaves $73 still in the car repair account. I’ll need to pad it pretty heavily in the next couple of months, as we know we’ve got some routine maintenance stuff coming up on our vehicles and it feels like every time we go to the shop its at least a thousand dollars! Cringe! At least we have time to anticipate and save for it instead of being caught by surprise. Health/Dental/Vision: $542. This gets auto-deducted from my paychecks so we can pay for healthcare out of pre-tax money. It’s sitting in a flexible spending account earmarked for health-care related expenses. Annual Fees: $100. Need to slowly start building this back up. The total current balance is $250 but we have a few annual (or semi-annual) fees coming up within the next couple months (e.g., Costco membership and county pet registration are two that come immediately to mind). Girls’ College Savings: $50. We save $25/each (x 2 girls) for college that’s automatically transferred monthly to designated 529 accounts. Savings for 2015 Roth IRA: $424. I also cleared out this savings in its entirety prior to filing taxes so I could make a contribution crediting tax year 2015. No other savings this month, but I wanted to report that I also withdrew all of the cruise money from its account (and have subsequently closed the Capital One 360 savings account). At the end of the trip, we were left with an extra $800 over and above what we’d spent. I ended up re-categorizing this money as income for May. That way it’s put in with our normal income rather than being viewed as a separate pot of money. This will be particularly helpful because I don’t get paid from my part-time job this month. We put a little less toward debt this month than I’d hoped (I’d originally planned to put $2,000 toward debt). Instead, we put a bit more toward savings, particularly in some categories where we know upcoming spending is imminent (e.g., birthdays, annual fees). In May, I’ll kind of trade-off. Our savings will probably be a little lower and our debt payments will be a little higher. One big thing to note: I don’t get paid in the months of May or August from my part-time job. Instead, my summer pay is split into two lump sums arriving in June and July. I’m trying to anticipate the lower income months and to spread the pay out when we have the higher income months. Also, I haven’t commented on our tax return yet. We had a return of $540 that hit my bank account just in the last week or so. Like our unspent cruise savings, I’ve simply categorized this as “Income for May” in our YNAB budget. Again – May will be a bit lower income month (given that I don’t get my part-time pay), so I’m hoping this will help pad our income a bit so we can keep up with the hefty debt payments that are planned this month. Have a great month, all! The 3-year anniversary of the day we first bought my car. First, I can’t believe it’s only been 3 years! For some reason I thought we’d had the car longer than that. Second, I can’t believe we paid off over $24,000 in car-debt in under 3 years! (Remember, we paid it off in January.) This is in addition to all the other debt we’ve paid in that timeframe (See my most recent debt update here). That blows my mind! 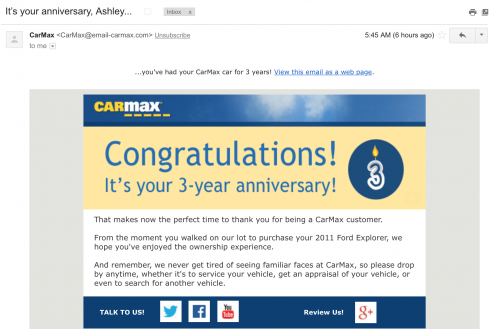 Third, nice try Carmax! Ha! We’ll be driving this car into the ground and, even then, when it’s time to buy a new car we’ll do so by paying cash (probably through private sale for a better deal) and we will NEVER EVER be financing through you again! No offense (I mean, Carmax was a dream to work with compared to Navient). It’s just that we’ll never be walking down that road again. Nope. Aside from a mortgage, we will never have consumer debt again. Nothing. Zip. Zilch. Nada. We’re busy at work right now building up a healthy emergency fund so we can be absolutely sure of it. So best wishes to you as a company, but the odds of getting any business from my family in the future is slim-to-none. We’ll wave at you as we drive by, though. Thanks for furnishing us with a great, reliable car! 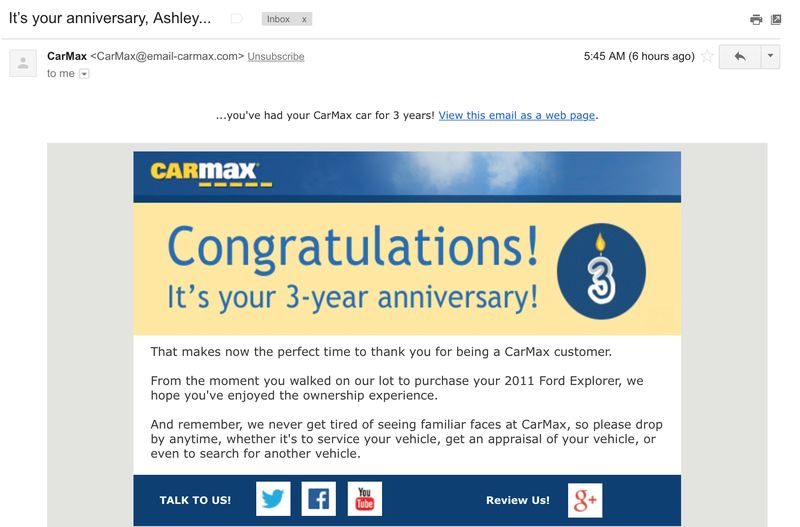 Side note: Just as a point of clarification, our original car loan was through Carmax. Once I started blogging here I refinanced through PenFed for a much better interest rate. That’s why the car loan is listed as “PenFed” in my debt spreadsheet. Just wanted to clarify.